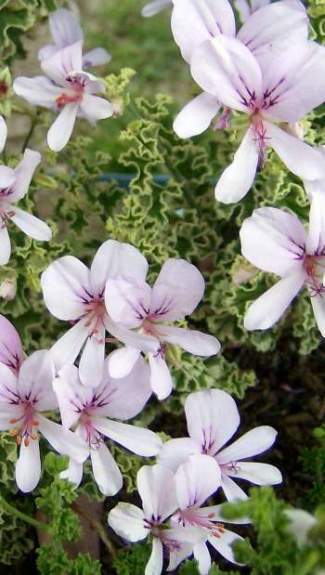 Prince Rupert Variegated is a variation of P. crispum, the lemon scented geranium. 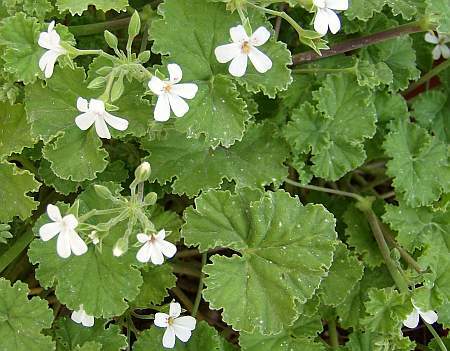 It has small green leaves outlined in white. It is a bit slow-growing, but a reliable and vigorous bloomer. Look at the bottom of the picture. You an see that some of the flowers belong to P. crispum ‘Minor’, yet they look just alike. The flowers open pure white and then turn a soft pink. 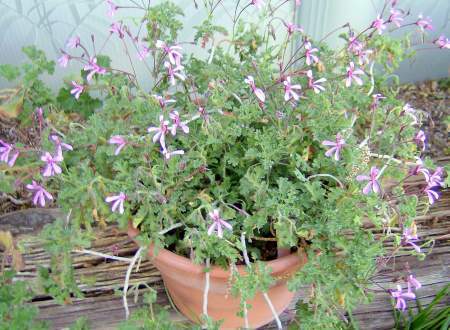 Pelargonium crispum ‘Minor’ is a lemon scented geranium. P. crispum ‘Minor’ is named for its tiny little leaves. In spite of his delicate appearance, Minor has a strong constitution and is a reliable bloomer. 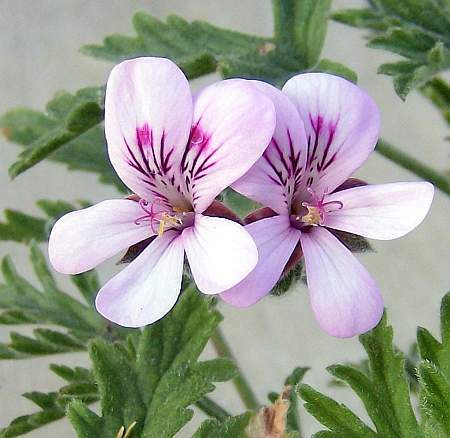 This is the scented geranium sometimes called “Fingerbowl Lemon”, the small leaves being floated in fingerbowls to add a refreshing lemon scent. 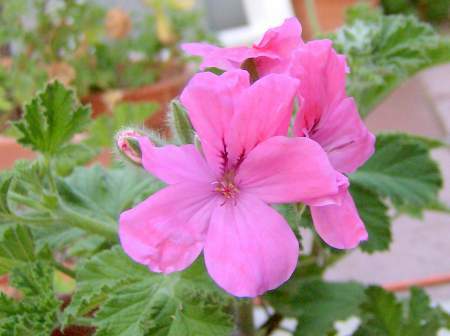 Pelargonium limoneum is a scented geranium. Limoneum is always fun to look at. I love the wild “bad-hair-day” growth habit as the season advances. 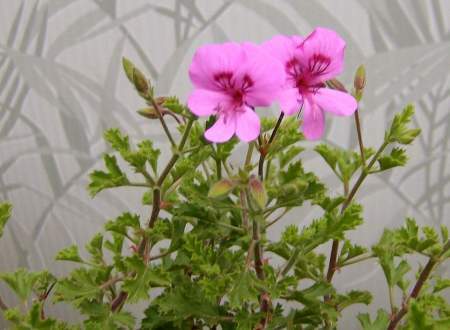 This would be the perfect scented geranium for one of those pots shaped like a human head! 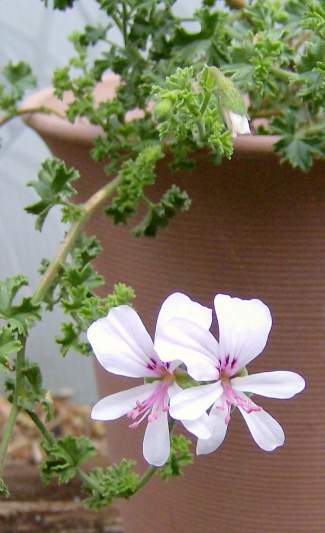 Pelargonium ‘Clorinda’ is a forest scented geranium. I’m especially enjoying Clorinda this year! After a couple years of minimal blooming activity, she is delightfully covered with deep pink flowers. Clorinda is a large, rambling plant with a woodsy scent. Clorinda has nice large pink flowers. Travelling through Kingman, AZ on Friday we stopped at a gas station. I spotted this low, green plant growing in the desert next to the parking lot. It had darling little pink flowers with five petals. A closer look revealed the storksbill seed pods. I was on it like Steve Irwin on a crocodile! What a thrill it was to meet a member of the Geraneaceae family “in the wild”! You better believe I collected seeds, too! 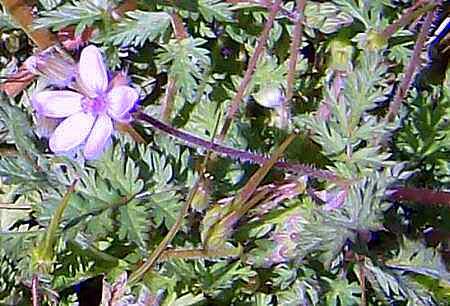 After some searching on the internet, I now believe this to be Redstem Filaree: Erodium cicutarium. 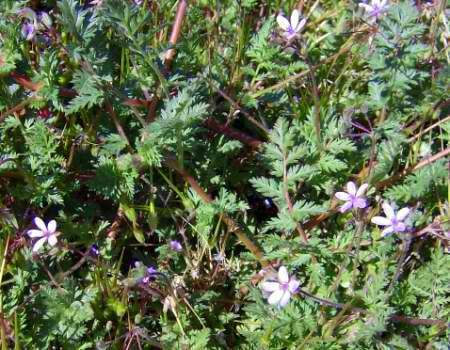 It is a widespread weed in California, directly across the river from Kingman. Apparently it is very adaptable and will establish itself in all kinds of habitats. In fact, my first experience with this plant was on the playground at my elementary school, where we would pick the seedpods and squeeze the stem end to see the seeds shoot out on their little springs. My mother recalls making little scissors with the pods as a little girl. 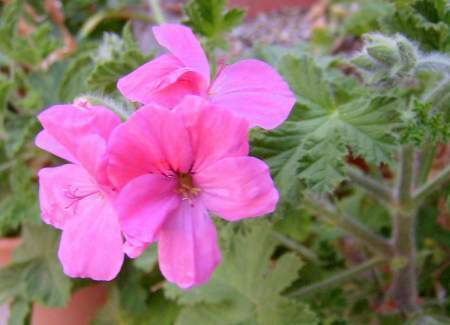 Pelargonium ionidiflorum is a celery scented geranium. P. ionidiflorum is putting on a fine show right now. She almost always has a few flowers, but now is gloriously abuzz with tiny pink flowers. I’m crazy about the lovely peachy keen Roller’s Satinique! So when I spotted P. ‘Lavendar Roller’s Satinique’ at Geraniaceae.com, I had to try it. Lavendar Roller’s Satinique has the same elegantly divided foliage, but the flowers are light lavendar with purple lines. I’m anxious to see how it performs in the summer heat. The original Roller’s Satinique is a trooper, thriving beautifully throughout the summer. What went on here? We had 44 mph wind gusts this afternoon. I looked outside and couldn’t believe my eyes! 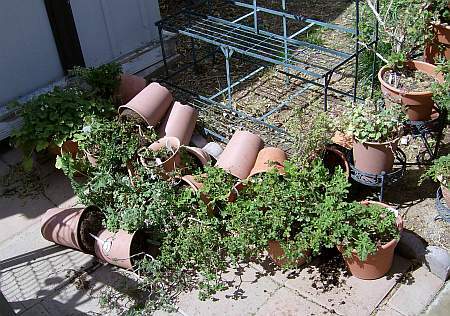 I guess those wind gusts were aimed directly at the plant stand populated by 6″ pots of scented geraniums. Apple geranium always seems to lead the way by blooming first. How wonderful after the dreary winter to see her friendly little flowers! 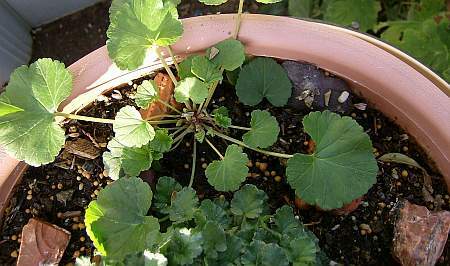 P. grossularioides (coconut scented geranium) seedlings often visit their neighbors. Coconut scented geranium is full of mischief and loves to travel. When I start finding her babies, spring is here. 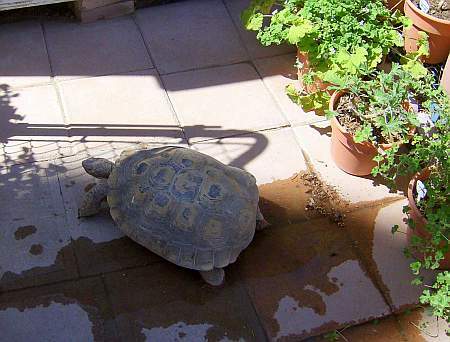 Max ventured out of his burrow for sun and water. Max came out of hibernation yesterday. He sunned for a couple hours and also drank from a puddle on the patio. He’ll start eating small amounts at first and then beome ravenous. The bermuda grass has not emerged yet, so I’d better be prepared with some broccoli! We are forecast to have a few days in the low 80′s. That will get him going.